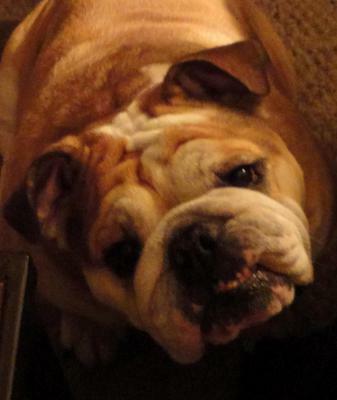 After 9 1/2 years of being the best family dog ever and loved by all, our English Bulldog Steve, died in his sleep the morning of Mother's Day. He looked so peaceful as if he were just sleeping. Two weeks prior Steve was diagnosed with congestive heart failure and put on medication. He seemed like a new dog for the days after that and had one last rally with energy and a sparkle in his eye. We thought he was going to be okay for a while, but his heart just couldn't go on any longer. We have so many memories of this sweet and gentle dog who did many things to make us laugh with his one of a kind personality. We hope you are peaceful and happy at rainbow bridge and are reunited with other family members that passed before you. We love you Steve and will miss you always. Kelly, I am so sorry for your loss. It's heartbreaking when our dogs leave us, they have such comparatively short lives :( It seems Steve went to the Rainbow Bridge peacefully and knew he was so very loved. He was a lucky boy. We also own and Olde English Bulldog and I know how much personality and sweetness they have. I'm sure Steve is expressing himself in the same way in Heaven. One day you will be able remember him with a smile instead of tears and he will always be in your heart. Such a sweet dog! We have an EBD and she will be 10 in July. I cannot think of a better way for her to pass that of passing in her sleep. I hope and pray that God gives us that gift, but not for awhile. Go with God Speed Steve. May your time at the Rainbow Bridge be filled with joy. Godspeed sweet Steve.. what a GOOD boy you are!